Store is an important component of material management since it is a place that keeps the materials in a way by which the materials are well accounted for, are maintained safe, and are available at the time of requirement. Storage is an essential and most vital part of the economic cycle and store management is a specialized function, which can contribute significantly to the overall efficiency and effectiveness of the materials function. Literally store refers to the place where materials are kept under custody. Typically a store has a few processes and a space for storage. 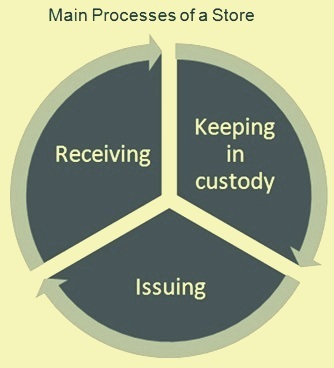 The main processes (Fig 1) of store are (i) to receive the incoming materials (receiving), (ii) to keep the materials as long as they are required for use (keeping in custody), and (iii) to move them out of store for use (issuing). The auxiliary process of store is the stock control also known as inventory control. In a manufacturing organization, this process of receiving, keeping in custody, and issuing forms a cyclic process which runs on a continuous basis. The organizational set up of the store depends upon the requirements of the organization and is to be tailor made to meet the specific needs of the organization. Store is to follow certain activities which are managed through use of various resources. Store management is concerned with ensuring that all the activities involved in storekeeping and stock control are carried out efficiently and economically by the store personnel. In many cases this also encompasses the recruitment, selection, induction and the training of store personnel, and much more. The basic responsibilities of store are to act as custodian and controlling agent for the materials to be stored, and to provide service to users of these materials. Proper management of store systems provide flexibility to absorb the shock variation in demand, and enable purchasing to plan ahead. Since the materials have a cost , the organization is to manage the materials in store in such a way so that the total cost of maintaining materials remains optimum. Store needs a secured space for storage. It needs a proper layout along with handling and material movement facilities such as cranes, forklifts etc, for safe and systematic handling as well as stocking of the materials in the store with an easy traceability and access. It is to maintain all documents of materials that are able to trace an item , show all its details and preserve it up to its shelf life in the manner prescribed or till it is issued for use. Store is to preserve the stored materials and carry out their conservation as needed to prevent deterioration in their qualities. Also store is to ensure the safety of all items and materials whilst in the store which means protecting them from pilferage, theft, damage, deterioration, and fire. The task of storekeeping relates to safe custody and preservation of the materials stocked, to their receipts, issue and accounting. The objective is to efficiently and economically provide the right materials at the time when it is required and in the condition in which it is required. The basic job of the store is to receive the materials and act as a caretaker of the materials and issue them as and when they are needed for the activity of the organization. Once the material has been received and cleared through inspection and accepted for use, it needs safe custody of the stores. The role of custody is to receive and preserve the material. A stage comes when the material is needed for use. Store at that time releases the material from its custody to the user department and the process is called ‘issue of goods. It might also happen that after partial use , some materials having useable value in future are returned to the store and thus they also become part of the custody again. Storekeeping activity does not add any value to the materials. In fact it adds only to the cost. The organization is to spend money on space (expenditure on land, building passage and roads), machinery (store equipment), facilities (e.g. water, electricity, communication etc. ), personnel, insurance, maintenance of store equipment, stationary etc. All of these get added to the organizational overheads and finally get reflected in the costing of the finished product. However, it is an essential function in any organization. An efficient stores management has normally the following main objectives. To ensure uninterrupted supply of materials without delay to various users of the organization. To ensure safe handling of materials and prevent their damage. To ensure proper and continuous control over the materials. Store can be of temporary nature which means that it has a limited life. Store can also be of permanent nature. Stores are classified basically in the following broad categories. Functional stores – Functional stores are named based on the function of the materials stored. Examples are fuels store, chemicals store, tools store, raw materials store, spare parts store, equipment store, refractories store, electric store, explosives store, and finished goods store etc. Physical stores – Physically stores can be centralized stores or decentralized stores. These stores are named based on the size and location of the store. Examples are central store, sub store, department store, site store, transit stores, receipt store, intermediate store, open yard store, and covered store etc. Stores are also classified by naming them after the departments to which they serve. Examples are construction stores, operation stores, rolling mill stores, blast furnace stores, and steel melting shop stores etc. Stores are sometimes classified based on the nature of materials stored in them. Examples are general store, bonded store, perishable store, inflammable store, salvage store, reject store, and quarantine store etc. Centralized storage of materials in a central store has advantages as well as certain disadvantages. The following are the advantages. Centralized store can cater to a wider range of materials which is not possible in a smaller store. Hence user department is to look for the material of its need only at one place. It contributes to the inventory control in the entire organization since the requirement of all the departments gets clubbed up. It makes better control feasible. It provides economy in storage space as materials when stored in larger quantities, occupy less specific space. Large stores can be provided with better and modern handling facilities. The operation can also be automated. Delivery at a single point decreases cost of delivery. Receipt and inspection of the materials can be organized more efficiently. Improved opportunities are available for the standardization of inventory. The turnover of materials is increased because of the maintenance of lower inventory and the probability of deterioration of materials during storage is correspondingly decreased. Manpower requirement for managing of stores get reduced. Also the duplication of records which takes place in decentralized store system is avoided. The disadvantages of a centralized store is as follows. Distance from the store and the user department gets increased which requires higher transportation needs from the store to the user department. If there are slippages or system not being well organized then there can be shortages of the materials which may results into unnecessary interruptions in production. There may be necessity of additional internal documentation in the store. The risks due to the fire and thefts are higher since the entire stock of the materials are concentrated at one place. The variety of materials to be stored can be large and it can create complications in the systematic storage as well as in storage procedures. Store personnel are responsible for carrying out the following functions. In the long drawn process of preserving the materials till its use ,some materials might get obsolete and unserviceable and may require removal from stores for clearing space for other incoming goods. This activity is known as disposal of materials for which auction etc is done. The materials , lying unused but have future economic value are said to form inventory, which needs professional handling. Inventory management thus is an important aspect of the stores function. One of the basic functions of store is to account for every material received in the store by maintaining proper records of all the incoming, stored and outgoing materials so that proper accounting and audit trail is maintained. Hence , record keeping is a vital function of store . Of course , it also goes along the various other activities. With the development in the information technology, the record keeping in store is also these days through electronic medium making the whole process smooth and efficient. Store is to operate in the close relationship with the purchase department. In addition to the day to day coordination with the purchase department, there are other important activities which can best be done by close cooperation between stores and purchase. These are as follows. Disposal of materials no more needed in the sore, or the salvaging operations etc. Close communication between purchase and stores with respect to order placement, receipt of materials, rejections, shortages, breakages, theft and loss of materials , if any. Also information is to flow with regard to changing production trends, slow or non moving stock, obsolete or surplus stock, scrap, etc. Articles on related subjects are available under following links.